of f 3.0 to f 4.0. Designed for astrophotography but also for visual use and ideal for technical applications. At the heart of every astrograph, in the optics we do not make any experiments. Only high quality parabolic mirrors from our own production are used. The tube is made as, as in the Ritchey-Chrétien telescopes in honeycomb pocket structure of aluminium and carbon fibre. A very elaborate production method on the cutting edge of technology, absolutely rigid and highly collimation stable. A perfect parabolic shape of the primary mirror and a low surface roughness are in a Newtonian system, the pre-requisites for sharp and crisp images. We guarantee that these conditions are met in each of our Newton astrographs. Our astrographs are available as standard light strong f3,8 system in four sizes: 16, 18, 20 and 24 inches in the standard. For whoever needs an even greater light intensity, we can offer apertures down to f 3.0. Since good correctors and reducers are already available on the market for Newtonian systems, we have omitted a developing them ourselves. You can use on our astrographs all Wynne correctors, Barlows and reducers with 2 inch and 3 inch diameter. If necessary, we can advise you. You will hardly find a Newton astrographs which has such consistent visual and mechanical precision down to the smallest detail as has our aluminium carbon truss astrographs. All major parts are machined from solid aluminium. Through a honeycomb pocket structure enormous stability and warping resistance is attained in such a lightweight construction. For construction and design of the systems we use the indispensable support of the latest 3D CAD. 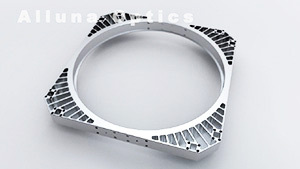 Complex parts and assemblies are modelled exactly as required and assembled virtually in advance. Thus in advance all parts can be optimized, for example, for weight, stability and expansion behaviour. To always be able to set the best view the top of the NA16, NA18 and NA20 is manufactured as infinitely rotatable in a highly accurate fit. By loosening two screws the whole upper part can be easily rotated. The fit is very accurate, the adjustment should be controlled at one turn of a screw. In addition, the entire shell, for example, for transportation is fully removable. All our astrographs possess as standard a motorised focuser for 2 "and 3" accessories. As with our Ritchey-Chrétien telescopes the telescope control system (TCS) assumes control also in Newton astrographs of the elementary principal functions of the telescope. Firstly, the climate of the optical tube and the primary mirror, secondly, the focusing on the eye piece, the on/off of the secondary mirror heating and the control of the optional robotic primary mirror cover (Information on DustCover). In the air mode you also get accurate temperature information. In the air mode you receive precise temperature information, the control of the fan is fully automatic, depending on the current delta between ambient and main mirror temperature. In focussing mode the current focus position is displayed in digits, mm or inches on the large display of a PC. With the GoTo function you can load stored focus positions automatically, quickly and accurately. The so-called focus drift can be compensated automatically. For a detailed explanation of the functions of the Telescope Control System TCS, please visit the TCS product page. ©2019 Alluna Optics Germany .